According to a survey conducted by the UK Office of National Statistics in 2017, the percentage of people drinking alcohol in Britain is reducing. In 2005, 64 percent of those surveyed stated that they had consumed alcohol in the seven days prior to the survey, this figure dropped to 57 percent in 2017. Sixty-five percent of people aged 45-64 years stated that they had consumed alcohol in the week prior to the survey, compared to only 48 percent of those aged 16-24 years old. Saxon Packaging believes that a major influence on this behavior is the rise of Generation Z (16-25-year-old) consumers, who are a more conscientious generation, concerned more about their personal and career advancement and health and wellbeing than socializing and attending parties. Thanks to the rise in social media, this younger generation is obliged to visit bars, pubs and clubs far less for social purposes, the company describes. According to Saxon Packaging, there is also far less pressure for people to consume alcohol from their peers. People are now opting to choose low and non-alcoholic beverages through personal preference. With this rising behavior, there is an opportunity for drinks manufacturers to attract this new market by offering healthier, flavorsome and interesting low and non-alcoholic alternatives. Many have predicted that this trend will result in bartenders creating a broader range of “mocktails” and sophisticated adult soft drinks. Alcohol reduction is also a key theme for 2019 and has formed a platform in the “balancing act” trend that the food and beverage industry has spoken of for several years. An Innova Market Insights survey (US, UK, France, Germany, China and Brazil) found that one in four consumers had cut down on their alcohol consumption in the past year. Offering solutions to target these groups that are lower in alcohol but still full of flavor will be on trend in 2019 and beyond, with “session” products remaining on trend, says the market researcher. The need for manufacturers to obtain the attention of the consumer is paramount and eye-catching packaging can aid this movement, according to Saxon Packaging. Consumers engage with packaging and packaging can trigger an emotion which is memorable to the consumer, the touch of the packaging, the excitement opening the packaging or even just the aesthetics, says the paper-based packaging provider. 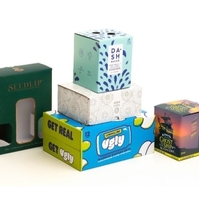 Saxon Packaging, which was acquired by in 2016 Saxon Packaging, hopes to further support and provide packaging solutions for all their customers in 2019, says the company. In light of Saxon Packaging’s research, the company is well-positioned to deliver packaging for low and non-alcoholic beverages. The company also notes that gift packaging is also a good way for a consumer to purchase a product for a friend or family member and give your product “gift-worthy” credentials.